The Oshawa Generals overwhelmed the visiting Peterborough Petes, skating to a 7-0 win in Game 1 of their Eastern Conference quarter-final series as Boston Bruins prospect Kyle Keyser posted a 33-save shutout. Six different Generals had goals as they outshot Peterborough 47-33. Anthony Salinitri and Nando Eggenberger got things started in the first before Brett Neumann and Brandon Saigeon increased Oshawa’s lead to 4-0 after 40 minutes. 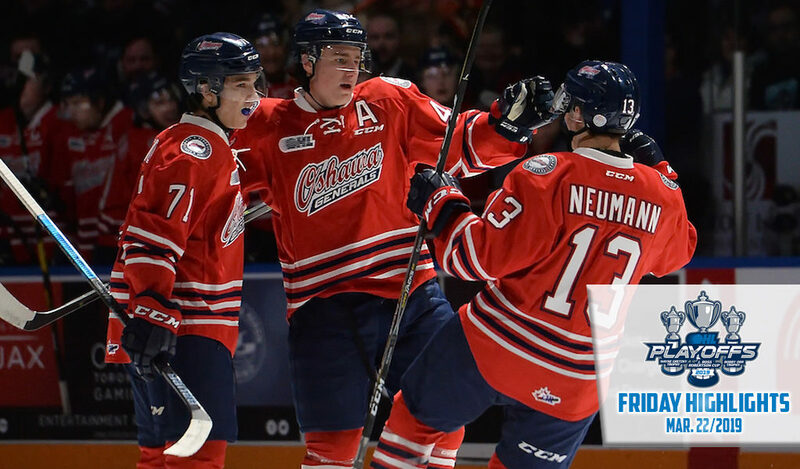 Neumann struck again in the third while Kyle MacLean and Ian Blacker also lit the lamp, sending the 4,353 in Oshawa home happy with a convincing win over an East Division rival. Rookies Tyler Tullio and Lleyton Moore each had a pair of assists while Saigeon finished with a goal and two helpers. Peterborough’s Hunter Jones was in for all seven goals, making 40 saves in the loss. The Petes look for a better effort on Sunday night in Game 2. 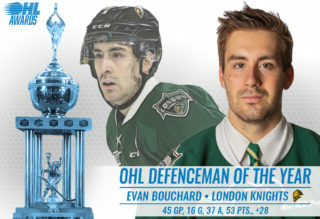 Edmonton Oilers prospect Evan Bouchard led the way with two goals and two assists as the London Knights edged visiting Windsor 4-3 in Game 1 of their first round series on Sportsnet. Bouchard opened the scoring 2:27 into action before setting up Alex Formenton on the power play less than three minutes later. He put his second past Windsor’s Kari Piiroinen midway through the second period before chipping in with an assist on a goal by Alec Regula. Will Cuylle, Tyler Angle and Connor Corcoran responded with Windsor goals as the Spits came up short on a late game push. The Knights went 2-for-2 on the power play, holding Windsor to 1-for-5. Jordan Kooy was the Game 1 starter for London, turning aside 23 shots for the win. The Knights and Spitfires meet in Game 2 of the series on Sunday afternoon. The Guelph Storm staked out a 3-0 lead, fending off the Kitchener Rangers late in a 4-2 win on home ice. 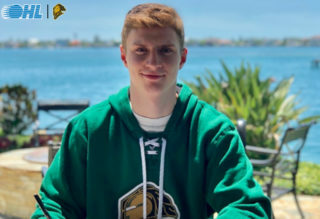 The Storm sent bodies to the net early as Nate Schnarr and Zachary Roberts scored first period goals with traffic in front of Kitchener’s Luke Richardson. St. Louis Blues prospect Alexey Toropchenko turned a pair of Kitchener defenders inside out to put Guelph up by three before the Rangers fought back with third period markers from Greg Meireles and Cole Cameron. Kitchener defenceman Justin MacPherson drew a pair of primary assists. MacKenzie Entwistle sealed the deal with an empty netter as the Storm outshot the Rangers 33-24 before a crowd of 4,364. The Storm take Game 1, looking to strike back against the Rangers who eliminated them in the first round of last year’s playoffs. Game 2 goes Sunday afternoon in Guelph. The Hamilton Bulldogs led 2-1 midway through the second period but penalty trouble would bite them as the Ottawa 67’s hammered home four power play goals in a 9-3 win on home ice. The 67’s scored five consecutive goals to take a 6-2 lead, eventually closing out a commanding win with nine goals on 41 shots. 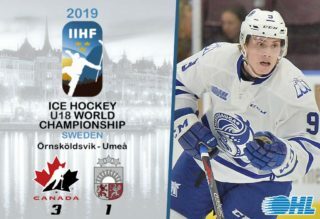 San Jose Sharks prospect Sasha Chmelevski led the way with two goals and two assists while 2019 NHL Draft prospect Graeme Clarke and overage winger Kyle Maksimovich also scored twice. Kody Clark, Nikita Okhotyuk and Noel Hoefenmayer also scored for the Barber Poles while Austen Keating and Lucas Chiodo each finished with three assists. 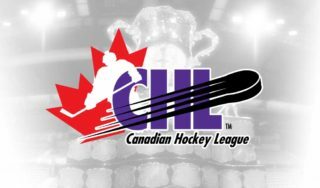 Eric Henderson, Matthew Strome and Kade Landry all scored for the defending champion Bulldogs while rookie Zach Roy was in for all nine goals, turning aside 32 shots along the way. The Ottawa win came before a crowd of 4,659. Game 2 of the series goes Sunday afternoon. 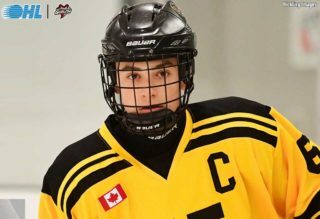 Nolan Hutcheson struck for his first OHL hat-trick, getting help with three primary assists from linemate Quinton Byfield as the Sudbury Wolves took Game 1 of their first round series with visiting Mississauga by a score of 5-2. Hutcheson scored twice in the opening half of the first period before Blake Murray took an Owen Robinson feed to put the Wolves up 3-0 before the end of the second. Keean Washkurak gave the Steelheads some life with 6:16 left in the third before Hutcheson completed his hat-trick less than a minute later. Shane Bulitka and Alan Lyszczarczyk swapped late markers as the Wolves sent 3,553 at the Sudbury Community Arena home happy. Ukko-Pekka Luukkonen stopped 29 of 31 shots that came his way while Jacob Ingham made 27 saves for the Steelheads. The two clubs go at it again on a Sudbury Saturday night.